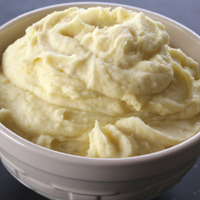 Perfect proportions for smooth and creamy mashed potatoes. A food mill and kitchen scale are the keys to perfection here, but even without them this will be your new favorite mashed potato recipe. Scrub and peel the potatoes. You can leave the peel on if you'd like. If you are using a food mill it will take the peel out for you. Cube them into 2-3 inch pieces. Place them in a large pot and fill with water. Add the salt, cover and bring to a boil over high heat. 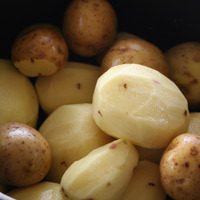 For perfect potatoes, weigh them after they are peeled and cubed. There are often spots on the potato that are discarded during scrubbing. 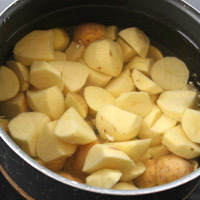 Cutting the potatoes into small pieces before boiling allows them to cook faster. There is no advantage in slow boiling potatoes, so you might as well do this. Smaller pieces will help with the food mill process as well. My food mill has a hard time with bigger pieces. Boil until tender 20-30 minutes. Drain the water. 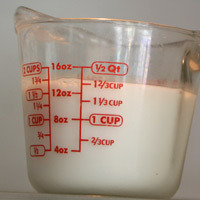 In a microwave safe container add the milk and butter. Heat in the microwave 1-3 minutes. Don't let the milk boil. The butter may not all be melted, but as long as the milk is hot, it will melt in the next few minutes or when you mix them into the potatoes. Set aside. 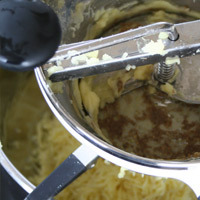 If using a food mill, set it up over the bowl of an electric mixer. Heating the milk keeps the potatoes hot. Place the potatoes in the mill and turn until they have all gone through. The peels are left in the food mill. I love the food mill for taste and texture, but it can be a frustrating piece of equipment to use. While using it I always wonder why I am not using an electric appliance, but when I eat and serve these it is worth every bit of the work! If you aren't using a food mill proceed to this step. 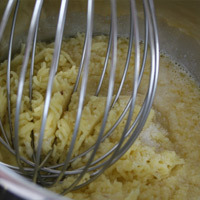 Fit the electric mixer with the whisk attachment. Add the salt and beat on high until light and fluffy. Transfer to serving dish and serve hot! No gravy needed. 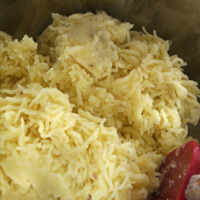 Undercooked- undercooked potatoes will leave you with a chunky mess. Err on the side of overcooking the potatoes because you will be mashing them anyway. Make ahead- mashed potatoes just aren't as good when they're made ahead of time. I've even tried boiling the potatoes, then reheating and mashing them, but they just weren't the same. Plan to eat an hour after starting the potatoes. 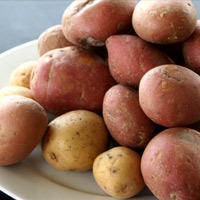 Cold potatoes- to serve the potatoes hot, be sure to heat the milk before adding it. 1. Scrub and peel the potatoes. You can leave the peel on if you'd like. If you are using a food mill it will seperate the peels for you. Cube them into (1)2-3 inch pieces. (2)Place them in a large pot and fill with water. Add the salt, cover and bring to a boil over high heat. Boil until tender 20-30 minutes. Drain the water. 2. In a microwave safe container add the milk and butter. (3)Heat in the microwave 1-3 minutes. Don't let the milk boil. 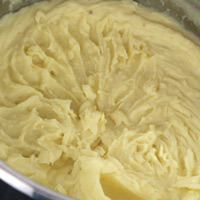 The butter may not all be melted, but as long as the milk is hot, it will melt in the next few minutes or when you mix them into the potatoes. Set aside. 3. 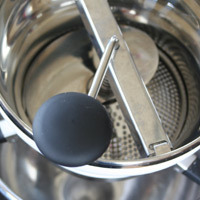 If using a food mill, set it up over the bowl of an electric mixer. Place the potatoes in the mill and (4)turn until they have all gone through. If you aren't using a food mill proceed to this step. Fit the electric mixer with the whisk attachment. Add the salt and beat on high until light and fluffy. Transfer to serving dish and serve hot! No gravy needed. 1. 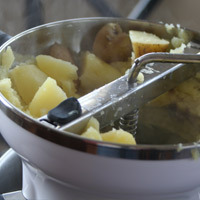 Cutting the potatoes into small pieces before boiling allows them to cook faster. 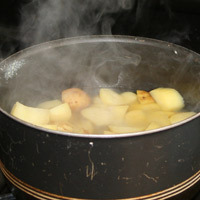 There is no advantage in slow boiling potatoes, so you might as well do this. Smaller pieces will help with the food mill process as well. My food mill has a hard time with bigger pieces. 2. Weigh the potatoes after they are scrubbed and cubed. There are often pieces that are discarded during this process. 3. Heating the milk keeps the potatoes hot. 4. I love the food mill for taste and texture, but it can be a frustrating piece of equipment to use. While using it I always wonder why I am not using an electric appliance, but when I eat and serve these it is worth every bit of the work!